A lictor (possibly from Latin: ligare, "to bind") was a Roman civil servant who was a bodyguard to magistrates who held imperium. Lictors were used since the Roman Kingdom, and according to Roman historian Livy, the custom may have originated earlier, in the Etruscan civilization. 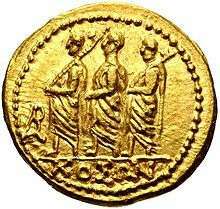 According to Livy, lictors were introduced by Rome's first king, Romulus, who appointed 12 lictors to attend him. Livy refers to two competing traditions for the reason that Romulus chose that number of lictors. The first version is that 12 was the number of birds that appeared in the augury, which had portended the kingdom to Romulus. The second version, favoured by Livy, is that the number of lictors was borrowed from the Etruscan kings, who had one lictor appointed from each of their 12 states. Originally, lictors were chosen from the plebs, but through most of Roman history, they seemed to have been freedmen. 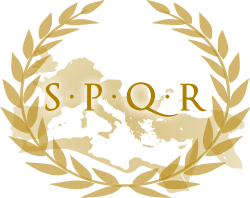 Centurions from the legions were also automatically eligible to become lictors on retirement from the army. They were, however, definitely Roman citizens, since they wore togae inside Rome. A lictor had to be a strongly built man, capable of physical work. Lictors were exempted from military service, received a fixed salary (of 600 sesterces, in the beginning of the Empire), and were organized in a corporation. Usually, they were personally chosen by the magistrate they were supposed to serve, but it is also possible that they were drawn by lots. Lictors were associated with Comitia Curiata and, probably, one was originally selected from each curia, since there were originally 30 curiae and 30 lictors (24 for the two consuls and six for the sole praetor). The lictor's main task was to attend as bodyguards to magistrates who held imperium. They carried rods decorated with fasces and, outside the pomerium, with axes that symbolized the power to carry out capital punishment. Dictatorial lictors had axes even within the pomerium. They followed the magistrate wherever he went, including the Forum, his house, temples, and the baths. Lictors were organized in an ordered line before him, with the primus lictor (the principal lictor) directly in front of him, waiting for orders. If there was a crowd, the lictors opened the way and kept their master safe, pushing all aside except for Roman matrons, who were accorded special honor. They also had to stand beside the magistrate whenever he addressed the crowd. Magistrates could only dispense with their lictors if they were visiting a free city or addressing a higher status magistrate. Lictors also had legal and penal duties; they could, at their master's command, arrest Roman citizens and punish them. A Vestal Virgin was accorded a lictor when her presence was required at a public ceremony. Sometimes, lictors were ascribed to private citizens on special occasions, such as funerals or political reunions, as a show of respect by the city. The lictor curiatus (plural lictores curiati) was a special kind of lictor who did not carry rods or fasces and whose main tasks were religious. There were approximately 30 of them, serving at the command of the Pontifex Maximus, the high priest of Rome. They were present at sacrifices where they carried or guided sacrificial animals to the altars. Vestal Virgins, flamines (priests), and other high-ranking priests were entitled to be escorted and protected by lictores curiati. In the Empire, women of the royal family were usually followed by two of this kind of lictor. The lictores curiati were also responsible to summon the Comitia Curiata (the Public Assembly) and to maintain order during its procedures.